The U.S. 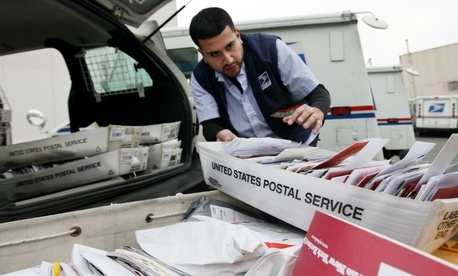 Postal Service will run out of money to pay for its retirees’ health care in 12 years if Congress does not take action to address the funding shortfall, according to a new audit of the benefit program. Funding for former postal employees has long been a sticking point in the fight to get the mailing agency’s finances back on firmer footing, and for the last 10 years USPS has faced a requirement to prefund the benefit for future retirees. USPS has defaulted on many of those payments and the Government Accountability Office now describes the financial outlook of the Postal Service Retiree Health Benefits Fund as “poor.” About 500,000 retirees rely on the program, GAO said, and current law has no contingency plan for what would happen if the agency runs out of money to pay for their care. The Postal Service has missed $38 billion in required prefunding payments into the retiree health fund since 2010. Congress instituted the mandate as part of the 2006 Postal Accountability and Enhancement Act, though the payments quickly became unsustainable after the bottom fell out on first-class mail use and the economic recession hit. In 2017, the Office of Personnel Management began tapping the fund to pay for the USPS share of retirees’ health care and payments going out exceeded the interest the agency collected. Even if the Postal Service were to begin making $1 billion or $2 billion annual payments into the fund, it would only extend the fund's shelf life by two or five years, respectively. Once the fund is depleted, postal retirees would remain eligible to participate in the Federal Employees Health Benefits Program but the agency likely would not be able to fund that participation on a “pay-as-you-go” basis. That would force Congress to decide how to fund the retirees’ care, or make changes to their eligibility. GAO suggested several options available to the Postal Service to mitigate its unfunded liability. One proposal was to shift its eligible retirees to Medicare as their primary health insurance provider. That is the favored approach in Congress and among postal unions. Bills in both the House and Senate would require former postal workers electing to receive federal health insurance to enroll in Medicare parts A, B and D as their primary care provider. The Senate measure would phase out the Postal Service’s share of retirees’ Medicare premiums over four years. While the proposal would shift costs to the federal government, advocates say it would add relatively little cost to the overall behemoth of Medicare expenditures while saving the Postal Service. If Congress decides it wants the government to pick up the cost of retirees’ care, GAO said, it could also opt to fund the benefit directly. That would undermine a fundamental tenet of the Postal Service, however: that it operates with only revenues it collects from its business. GAO noted that most private companies and some state and local governments have tightened eligibility for benefits, reduced the benefits or eliminated them entirely. According to a recent Kaiser Family Foundation study, just 11 percent of private companies with at least 200 employees that offered health benefits to active employees also offered benefits to retirees. USPS could also force retirees to pay a higher share of their premiums, with GAO citing examples of other entities requiring former workers to pay 100 percent. Such a strategy “could increase the challenge for retirees to ensure their accumulated resources last throughout retirement,” GAO said. Other options GAO floated included shifting postal retirees to a “voluntary employees benefits association” to administer the program outside of government confines or to pursue a more aggressive investment strategy for the retiree health fund. GAO called on Congress to take action quickly to stave off a potential crisis. USPS Chief Financial Officer Joseph Corbett agreed that Congress must act, in particular stressing the benefits of Medicare integration. He also suggested that a more aggressive investment strategy was recognized as a best practice.